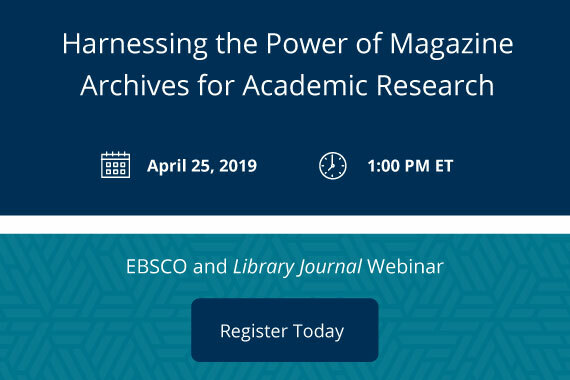 Join EBSCO and Library Journal for a look at how digital magazine archives can enhance and enrich academic research and fill in any gaps in your library’s collection. You will also learn the many ways that magazine archives support the most engaging experiences of research in science, humanities, culture, writing, movements, war, protests, agriculture, education, business, architecture, urban growth, philosophy, sport, gender, diversity, psychology, linguistics, music, religion and so much more. Join Professor Galin Cranz (Author of “The Chair”) and Joe Agati (Director of Design Agati Furniture) for an in depth discussion about seating and how it impacts patrons' health and your library's success. Professor Cranz will explain the origins of postural and seating norms that have developed in western culture. How did we end up with chairs and why do they play an important role in our society as symbols of status and refinement? Recorded Books and Library Journal have conducted a benchmark survey on digital content provided by public libraries of all sizes in North America. This survey revealed what hundreds of your peers are saying is important in offering digital content—from the perspective of both the librarians and the patrons. Join us as we discuss the results of this survey and share new ideas for improving your library’s digital services offerings. How Will Advanced Intelligence Impact Library Systems Over the Next Decade? In an engaging and moderator-guided Q&A, a panel of library visionaries will present their views on the long-term needs of academic libraries and will examine how advances in research in intelligent systems could affect the institution over the coming decade. While ten years might seem like an eternity for some, for others it is normal to have both two and five-year plans, as well as speculations about possible needs in ten years. Every public library’s mission statement includes lifelong learning in some form or fashion. It’s just that important, right? In this webcast, a panel of three librarians specializing in adult services discusses the benefits of online learning programs, tips on how to incorporate these solutions into your existing programming, and best practices for promoting eLearning options to the community. Together with campus IT, Ithaca College implemented a new reading list tool, Ex Libris Leganto, embedded into Ithaca’s learning management system. This improved students’ access to course resources, directly impacting teaching and learning. Now, a year after the pilot-phase, the library has integrated this new service to all instructors for delivering reserve and e-reserve content.